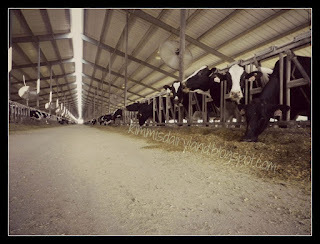 Kimmi's Dairyland: Dairy FAQ: What are holidays like on a dairy farm? Dairy FAQ: What are holidays like on a dairy farm? What are holidays like on a dairy farm? Holidays are busy for just about everyone and a little stressful at times. Between holiday parties, shopping for gifts, cooking and trying to balance everything else in life, it's no wonder it's a little hectic. On a dairy farm, things are even busier. Everything that you think of as holiday activities happen on top of the already-busy farm schedule. I've mentioned before that we have a calendar in our manger where cows come to eat hay. We record when calves are born on it. The cows, however, pay absolutely no attention to calendars. Or holidays. Or birthdays. Or anniversary trips. Or any other special occasion. They need to be milked everyday. Twice a day and on some farms, three times a day. People sometimes ask me why dairy farmers hire other people to work on their farms. Dairies are busy places and sometimes there's more work than there are family members to help, so, like any other family business, they bring in additional help to get the job done. This doesn't make the farm any less of a family farm. It just means they are providing additional jobs for others in their community and further stimulating the local economy. This helps everyone. Farmer or not. Back to the busy dairy schedules. In addition to twice daily milkings, cows need to be fed (and so do those cute baby calves), pens need to be cleaned, and of course, cows need to be checked. On a dairy farm, there's so much interaction with the cows that if one is sick, she is generally discovered pretty quickly. If it's something that requires medical attention, the vet is called to come take a look at her. Sometimes this is in the middle of the night. Again, cows pay no attention to calendars or clocks. Thanksgiving dinner may have to be early or later to work around milking. Many people will have an early dinner and then head back out to the barn. If there are cows calving, they need attention too. Occasionally, a calf will be backwards, breached or just need assistance. This can't wait until after Thanksgiving dinner. It must happen now. Christmas is much the same way. Presents don't get opened until chores are done. If you grow up like this, you don't know any other way. Cows always come first. As you are preparing your Thanksgiving dinners this Thursday, don't forget to use lots of milk, butter and cheese and know that dairy farmers appreciate you supporting their family businesses by using dairy products. They don't get the day off completely, but there's always time for family. Have a great holiday weekend with your families! Dear Kimmi, thank you for your excellent article on "What are holidays like on a dairy farm?". By the way, the photography were really awesome. Keep the great writing skill up. Thanks again for giving me a good resource. Waiting for your reply! Thanks! Enjoy your holiday weekend! I love that you give so many people a peek into a world they ususally never get exposed to! Thanks for sharing with us at Country Fair Blog Party! Thanks for having me! It's always a great time seeing what everyone posts each month. Happy (early) New Year! If you want to give surprise to your family members then nothing is better than tour package. During the tour you will get a chance to spend some quality time together. It will make strong bonding between each other. This tour like https://www.imanali.in/manali-tour-package-kolkata will give you the long lasting cherishing memories to remember during the pastime. Kullu Manali is encompassed with the picturesque view and it covers places like Rohtang pass, Solang valley, Chandratal lake, Naggar etc.https://kullumanali.org/kolkata-kullu-manali-4-night-5-days-tour-package/ Plan a trip for 4-night-5-days from Kolkata to Kullu Manali and enjoy the vacation.